Last week, we discussed the success two budget retailers – Aldi and Lidl – have had in the past year, and speculated about what the larger brands could do to counter this industry trend. One of the big beasts that recently announced better than expected figures for the Christmas period is Tesco. Belying gloomy City forecasts, the news saw shares spike as optimism returned for the future of the hitherto beleaguered organisation with the turnaround being spurred by lower prices on certain products and more staff in stores. As I have written about previously in this column, YouGov data indicates that this improvement has been a long time in the making. 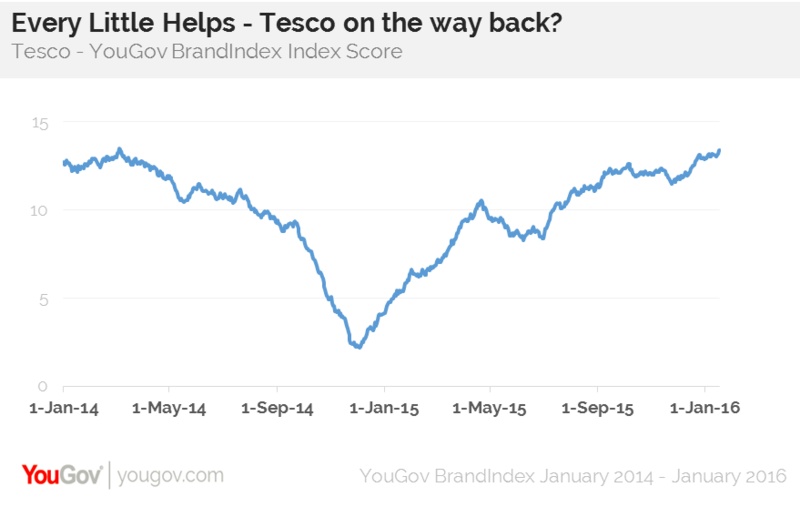 Anyone looking at consumer sentiment towards the brand would have seen that the underlying signs for Tesco have been improving for a while. Our Index score shows a brand’s overall health and is a combination of several metrics – namely its Impression, Quality, Value, Satisfaction and Reputation measures. From a low point at the tail end of 2014 Tesco’s Index score saw consistent improvement throughout 2015, continuing into this New Year. 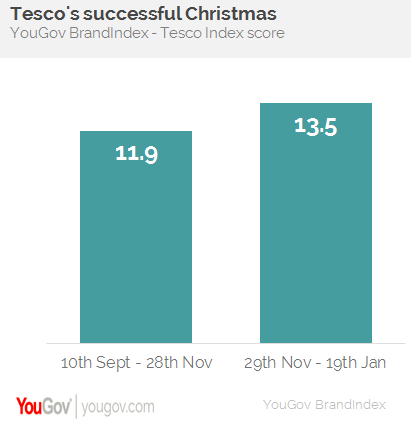 In fact, our data points to this metric being at a two year high-point, both predicting and reflecting the Christmas success noted in Tesco’s announcement. What’s more, while the general trend is one of improving fortunes, our data also reflects the downturn experienced by Tesco in the 13 weeks to 28th November when it reported a 1.5% fall in sales. However, the subsequent improvement also mirrors the most recently reported figures. This improvement has not abated yet, providing further good news for the brand. Of course, there is still a great deal of work to be done both from an operational and marketing point of view to restore Tesco to its former glories. Whether this year is characterised by the slowing of progress for the discounters is very much up for debate, but perhaps the right strategy is finally being pursued by the larger supermarkets. We will be keeping a close eye on the data for the emergence of any new trends in the industry.